Well I know it's been a long wait, but I've finally found a strikingly beautiful aquascape made by a fellow hobbyist that is truly worthy of examination. 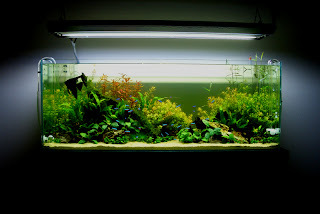 This aquarium is the work of Sergio C., who goes by SuRje1976 on both Aquatic Plant Central and the Planted Tank forums. It is an ADA 120P tank, meaning it is 120 cm long. As you can see, he went all out on top of the line equipment. But aside from the fancy glasswork, this is a great aquascape. The profile of this aquascape is an off-center V shape. This creates visually interesting height differences, and these sloping lines also help to guide the viewer's eyes. Even the hardscape seems to follow the profile, maintaining the relaxing lines of the aquascape. The main focal point (in red) is done by the book. It is perhaps the easiest way to create a focal point and one of the most effective ways. The red plant is also positioned perfectly according to the Golden Rule of aquascaping. The secondary focal point (in yellow) is also a product of the profile, and is located where the two sides of the V intersect. This small scene is perhaps one of the most interesting in the aquascape and is very pleasing to the eye. 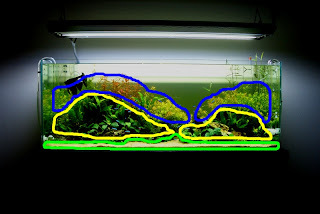 The flow follows the profile and hardscape of the tank as well, guiding the eyes from the main focal point to the secondary focal point. It is done in a way that is natural and relaxing and therefore gently guides the viewer's eyes. Finally, the foreground (green), midground (yellow), and background (blue), show more starkly the effects of the V shaped profile and how Sergio has used it to his advantage. Note the division created by the V is not a straight line through the background and foreground, but a more natural wandering line (red). The foreground here is entirely sand, which is becoming more and more popular, as many foreground plants require constant maintenance. The sand also adds contrast to the aquascape, highlighting the plants behind. Sergio's aquascape is a classic design with clear inspirations from Takashi Amano that blends all the tenets of the nature aquarium style. The result is a wonderful aquarium that is pleasing to look at and a work of art. For more information on Sergio's tank and his many DIY projects, check out his journal. Nice. I like that layered look. I'm trying to figure out why he'd have one big angel fish in there with all those cardinals. Maybe he wanted "the star of the show". The angel was actually an "artifact" from a previous tank. Since those pictures were taken, she's found a new home ;).